Belt? Will cut through her bui bak not. BUIJI SO AFFECTED BY OUR COMMENTS. TODAY SHE WORE A FREAKING BELT TO HIDE HER FATS. I go get my coke and popcorn. Wait for me. usually if close family... will go..
"oei.. closer leh.. stand so far for what"
And I like the fact that one auntie prefer to stand on a stool than stand next to them. Wear belt got use meh ???? Her fashion sense..you know lah. Hahahaha. I'm thinking of the flowers on her head.. ET don't understand about fee for IFC or Childcare. A non working single mum needs to pay 1.7k to 2k for IFC? Will IFC takes in CAG salary for consideration? I chop confirm CAG is not a high salary earner. CAG name inside birth certificate but Buijikam and him do not have legal marriage certificate. So IFC will consider Bell under single parent scheme? 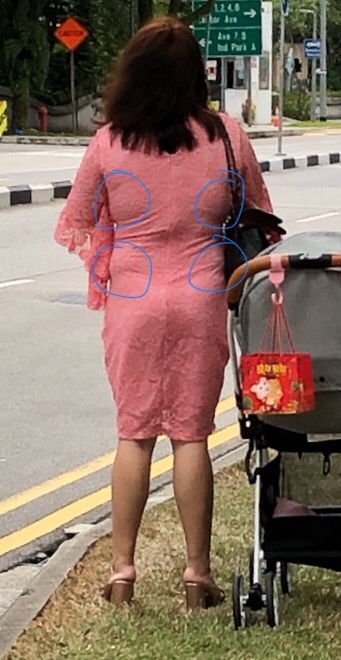 Buiji got simi lj waist ??? Already tell her that she wearing the wrong 内在美 and dress with cut not suitable for her weird body shape. 1) all the relatives do not want to create an ugly scene by stopping buiji and family from taking the photo just because the old granny is present? 2) it will be very suay (since its CNY) to go and create a potential argument with Buiji by disallowing them from the family photo.